Holiday package stays at our four-star Inn are truly magical experiences. Enjoy a Christmas full of splendor, with Candlelight Christmas Evenings, dazzling decorations, and exclusive access to Santa in our lobby. Whether ringing in the new year or celebrating the warm-weather holidays with us, your package stay includes special dinners, spectacular fireworks, live music, and a host of festive offerings available only to guests of The Inn. Book your holiday at The Inn on Biltmore Estate, where each guest is treated to the superlative service and gracious hospitality for which we are renowned. Package rates cannot be combined with any other discount, offer, or group room rate. Imagine an oasis of style and charm where you enjoy a luxurious room, the finest amenities, and the most lavish of morning meals. From the moment you arrive, you’ll be treated to the gracious hospitality for which the Vanderbilts were renowned. Come experience the kind of relaxation our four-star Inn inspires when you make it your home away from home. Make reservations by calling 866-336-1245. Biltmore House admission is not included with this package. Please purchase admission when making your hotel reservations. *Subject to applicable tax and availability. **Gratuities and delivery fees are not included. Make the first weekend of summer a special occasion to honor our veterans with this festive weekend that pays tribute to the past and celebrates our country’s freedom with fun activities for all. Call 866-336-1245 or book online. Special Offer: Arrive early on Friday, May 24, or extend your stay through Monday night, May 27, and save $100 per additional night. Additional nights include accommodations, Chef’s Breakfast Buffet, and valet parking at The Inn. *Minimum two-night stay. Subject to applicable taxes and availability. **Not included in Passholder package. The best of a traditional Independence Day celebration is captured in a carefree getaway that includes an Ice Cream Social on The Inn’s Grand Terrace with live music and treats, as well as a perennial guest favorite, our July 4th Celebration Dinner. Enjoy old-fashioned fun at Antler Hill Barn with live music, games for all ages, and a dramatic fireworks display on estate grounds. 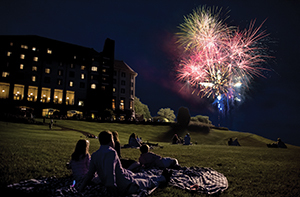 July 4th Celebration Dinner at Antler Hill Barn, 6 p.m.–9 p.m.
Fireworks display following Celebration Dinner, Thursday, July 4, 9:30 p.m.
Fireworks at The Inn, Thursday, July 4, 9:30 p.m.
Special Offer: Extend your stay by arriving Monday, July 1, or stay through Friday, July 5 and receive $100 off per additional night. Additional nights include accommodations, Chef’s Breakfast Buffet in The Dining Room, and valet parking at The Inn. *Minimum two-night stay required; stay must include July 4. Subject to applicable taxes, gratuity, and availability. Commemorate summer’s finale with a blue ribbon celebration inspired by the Annual Estate Fair founded by Edith Vanderbilt in 1905. The fall fair honored the estate’s farming heritage with traditional fair competitions for best flowers and vegetables, plus events and activities for all ages. Like vintage country fairs of that era, today’s Labor Day festivities at The Inn feature an abundance of old-fashioned family fun, live music, and a fantastic fireworks display. Labor Day Celebration Dinner at Antler Hill Barn, Sunday, September 1, 6–9 p.m.
Book online or call 866-336-1245. Special Offer: Extend your stay by arriving early on Friday, August 30 or by staying through Monday night, September 2, and save $100 per additional night. Additional nights include accommodations, Chef’s Breakfast Buffet, and valet parking at The Inn. Subject to applicable tax and availability. Requires a minimum two-night stay. Must stay over on night of Sunday, September 1. Rates are based on double occupancy in a deluxe double or king room and are subject to applicable tax and availability. Gratuities are included for all package meals; all other gratuities not included. Gather with loved ones for a truly memorable Thanksgiving at our elegant four-star Inn. Experience superlative service, a perfectly prepared holiday feast comprised of the finest seasonal ingredients, and a variety of festive activities. Marvel at the majesty of America’s Largest Home® bedecked in Christmas finery during your Candlelight Christmas Evenings visit. Enjoy stunning views of the estate and Antler Hill Village aglow with thousands of holiday lights. This Thanksgiving, relax into gracious hospitality with a luxurious Biltmore getaway. Make reservations online or by calling 866-336-1245. Special Offer: Extend your stay by arriving on Tuesday, November 26, and receive $100 off on the additional night. Additional night includes accommodations, Chef’s Breakfast Buffet in The Dining Room, and valet parking at The Inn. *Subject to applicable tax and availability. Requires a minimum two-night stay. Spend Christmas at our elegant four-star Inn and enjoy the luxurious, care-free holiday getaway you’ve always wanted. Featuring fine holiday dining, personalized service, and gracious hospitality, this special escape allows you to completely relax as you share quality time with loved ones. 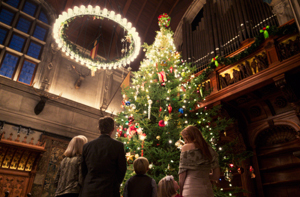 Experience what just may become your new yuletide tradition; an enchanted Christmas on George Vanderbilt’s magnificent estate. Bring your paper to our annual weigh-in! Special Offer: Extend your stay by arriving early, December 20 – 22 or staying through December 26, and receive $100 off per night on the additional nights. Additional nights include accommodations, Chef’s Breakfast Buffet in The Dining Room, and valet parking at The Inn. *Subject to applicable tax and availability. Requires a minimum three-night stay. Does not include Candlelight Christmas Evening visit of Biltmore House. Guests may make reservations for Candlelight Christmas Evening visit for December 23 for an additional $25. 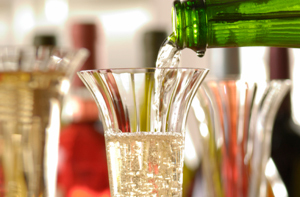 Ring in the new year immersed in the elegance, luxury, and four-star service for which The Inn is renowned. Allow us to handle every detail while you celebrate in style with loved ones and make the kind of memories that last a lifetime. This New Year’s escape features a fantastic four-course feast, live music, the traditional midnight toast, and a dazzling fireworks display! *Subject to applicable tax and availability. Requires a minimum two-night stay that includes night of December 31, 2019. Does not include Candlelight Christmas Evening visit of Biltmore House. Guests may make reservations for Candlelight Christmas Evenings visit for an additional $25. You are cordially invited to the annual New Year’s Eve Gala at our four-star Inn, a splendid black-tie celebration of unparalleled elegance and style. A most spectacular way to bid farewell to 2019, this premium getaway’s signature event is a truly grand and unforgettable experience. Late check-out of 1 p.m.
*Subject to applicable tax and availability. Requires a minimum two-night stay that includes night of December 31, 2019. Does not include Candlelight Christmas Evening visit of Biltmore House. Guests may make reservations for Candlelight Christmas Evening visit for $25. **Guests must be 16 years or older to attend the Gala. Guests with children can reserve the package. Guests under 16 years of age will receive the breakfast and estate admission tickets, but will not be able to attend the Gala.